Plantar fasciitis is a foot condition that is characterised by a pain in the heel, caused when the plantar fascia ligament becomes torn or inflamed. This is most common as a result of the repetitive movements made when exercising, but also occurs during pregnancy, when increased weight puts greater pressure on the feet. 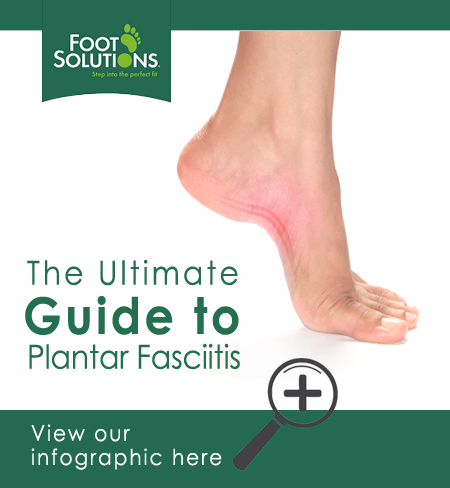 Here at Foot Solutions, we know how painful conditions like plantar fasciitis can be, and we spend a lot of time giving our customers information and advice on how to avoid or relieve these problems. The shoes you wear can make a huge difference to how comfortable you feel, and we know that you’ll be surprised at how much good shoes can help. Heel pain on rising. When you wake up, you may experience heel pain as you stretch out muscles that have been resting overnight. To begin with, you may not think this is a serious problem as pain may come and go, but if it is plantar fasciitis, it will continue to worsen until it is allowed the time and correct environment to change. Pain after long periods of standing. When you stand for long periods of time, you put a lot of pressure on the tendons and ligaments of the feet, and if these are not supported properly, problems like plantar fasciitis can be the result. Wearing good quality shoes that fit your feet well and offer a good degree of cushioning and support can help to prevent foot conditions from developing, as well as allowing existing problems to heal. Pain related to exercise. Exercise, including running, that involves repetitive movements, can cause or worsen plantar fasciitis. It is vital to wear training shoes that support your feet properly, and to take care where you are running. For example, running on roads is much more likely to damage your ligaments and muscles. If you are experiencing any of the above and you suspect that it could be plantar fasciitis, visit your doctor to discuss this. The usual treatment involves rest, ice applications and specific stretching exercises, which should help to rehabilitate the ligaments and alleviate the pain. Your footwear could be the reason that you are experiencing pain in your feet, and the good news is that this is often an easy problem to correct. If you have been wearing shoes that do not fit your feet properly, or do not offer enough cushioning, you may feel instant relief when you begin wearing shoes that are better suited to your feet. Visit us at Foot Solutions for professional fitting advice and measuring, and let our experienced staff find the best options for you and your lifestyle. We have a great range of casual, formal and training shoes, so pop into your local store and treat your feet today!